The leaves- 1 cup; pepper and cumin seeds- 2 tsp; garlic-1; tamarind water- 2 cup; oil-1tsp; turmeric powder and salt-as required. Sauté ‘thuthuvalai’ leaves, pepper, cumin seeds and garlic in the oil and grind. Add turmeric powder, salt, and tamarind water an water with it. Fry mustard in the oil and add thie ground mixture and switch off the stove after a boil. 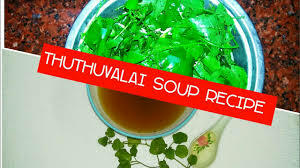 Now the ‘thuthuvalai’ soup is ready.